KATHMANDU, Feb 17: A meeting of the representatives of various student unions and officials of Tribhuvan University (TU) on Thursday decided to postpone the Free Student Union (FSU) elections, earlier scheduled for February 25, to March 1. Nain Singh Mahar, president of Nepal Student Union, the student wing of the Nepali Congress, said that the FSU polls have been deferred by a week. 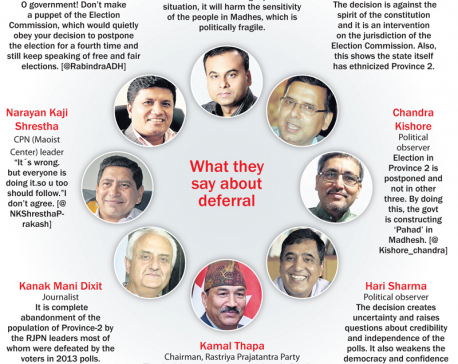 “All sides at the meeting today agreed to hold the FSU polls on March 1,” Mahar told Republica. The student organizations and the TU officials decided to defer the polls by a week owing to protests from some dissident student organizations at various TU-affiliated colleges. The TU Senate meeting last month introduced a new policy which made it mandatory for a FSU election candidate to be below 28 years of age at the time of election. Some of the student organizations have been protesting against this decision as well. This is the first time that TU has set age bar for the candidates.